EcoPart draws low-potential heat from a ground collector. This can be either horizontal (buried 1.5 under the ground level) or vertical (70-120m deep boreholes). Ecological heat-transfer fluid circulates in the ground collector that is designed and calculated individually for each installation. EcoLogic is an intelligent controller that controls both the heat pump and an entire heating system; it can also control even a cascade of up to 3 heat pumps. The central heating unit involves everything a domestic boiler room may contain. 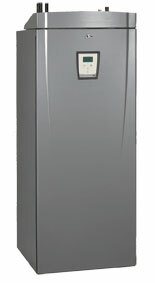 After being easily connected to a heating system and water mains, the unit covers the complete heat demand of a single-family house – heating, heating-water accumulation, heating sanitary water by a heat pump and the integrated 9kW electric heating rod. Of course, also solar collectors, a wood-fired boiler, a fireplace heat exchanger or other heat sources can be connected as well. This compact solution excels with its extra low heat loss and occupies a little space. 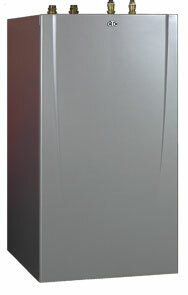 The central heating unit contains a control board that controls heating in the house, heating of DHW, heat pump operation, and switches output steps of the heating rod. Heating is controlled by OTC using both the outdoor and indoor sensors that are included in the packing. Heating water is mixed by the integrated 4-way valve. The unit is divided into 2 sections – a lower zone for preheating DHW and heating water, and an upper zone for DHW afterheating. The heat pump is connected to the lower cooler section, working thus at lower temperatures for most of the time, just from time to time it heats up the upper section to a higher temperature sufficient for DHW. The electric heating rod in the upper zone is then used only for afterheating DHW to the set temperature. The controller connects the el. heating rod gradually, in small steps (1,5 kW), in order to reach a precise temperature and max. savings. steps first, and after that even the heat pump. The current sensors (included in the EcoHeat packing) shall be installed on the mains supply (e.g. to the main fuse) and the value of the main fuse shall be set in the controller. This function enables using EcoHeat for heating even in houses with a low-value main fuse that would be otherwise unsuitable for operating an electric boiler and a heat pump.